I have gone to church my whole life. Even in college when no one was “making” me. It has been something that I have always done; sometimes out of obligation, other times out of need but mostly because of the joy it gives me. There is something so sacred about joining with others in worship and prayer. And the connections run deep. Very deep. There is nothing like the love of church family. 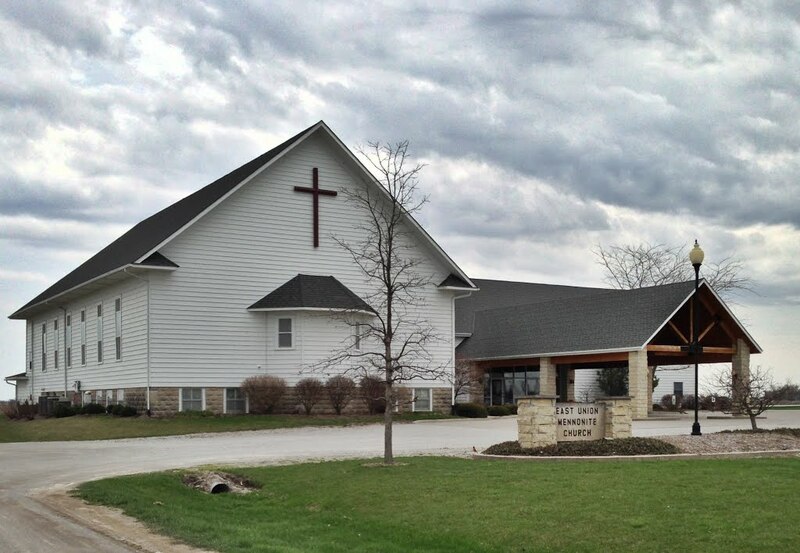 My parents church… the church that I grew up in. I witnessed it during a long period of health problems in my father. As an active farmer at the time of his stroke, he had many duties and responsibilities with livestock and crops that could not go unattended. 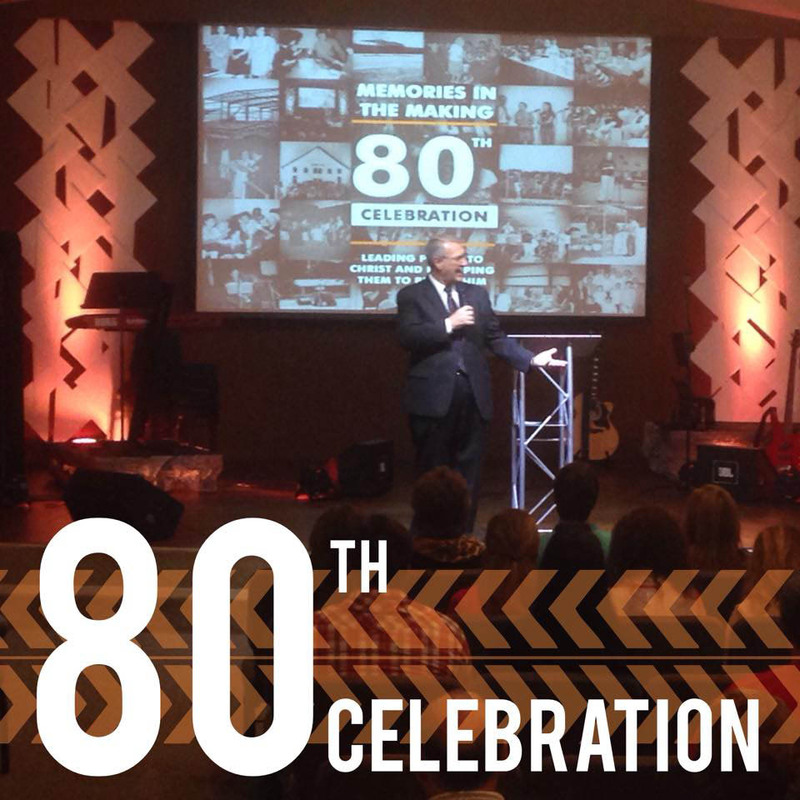 His church family was truly a life saver in that many people stepped in and assumed responsibilities and did undesirable jobs to continue the running of the farm. And when it was discovered that he would never be able to farm again, they were there dismantling equipment and a farrowing house (which was a really yucky job). They drained lagoons, and got things ready for auctions. They were there with all their combines and grain wagons when it was time for harvest. It was truly one of the most beautiful things I have ever witnessed. 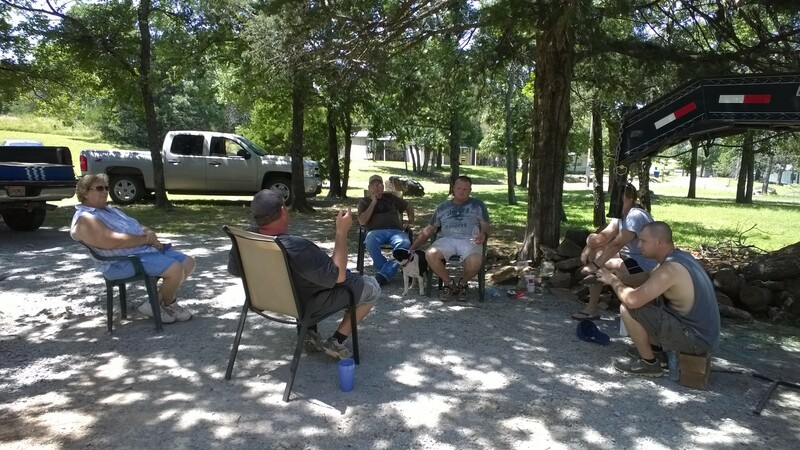 A group of men linked together by God’s love literally being Jesus’ hands. I have experienced the love of church family in my own life. When I got a phone call late at night from my mother 12 hours away and friends and family are quick to step in to take care of my children and church responsibilities. The love of friends sending care packages as I travel. The love of friends at church gathering around me in prayer when I got the call from my mother with the test results and her telling me it is cancer. I was gone from my church for weeks at a time due to my parents health and I found myself missing it. I missed the fellowship, I missed the community, I missed being part of something that was bigger than myself. And when I returned, I was inundated with questions of how my family was. Because they cared about me. It is for that same reason that I bake bread or make a meal for someone that just had a baby, or surgery or had a death in the family. Because there is joy in the giving; a blessing to share God’s love with others. And I share it not just with my church family but for my neighbors and friends regardless of their beliefs. Because it is not just about church, but also about sharing God’s love with whoever needs it. And really, we all need it. I encourage you, if you are not part of a church, please find one. The denomination or the sign on the front door doesn’t matter as much as the part that you are part of something that you were created to be a part of. God designed us to gather together in worship; to be part of something that is a unified community. To be part of something greater than ourselves. Where one can gather together with others of like mind, like purpose and a common love for our God. See for yourself, there is something better when we are all together. I have grown up knowing what hard work is. While I hated working on the farm when I was younger; I learned the reward of working hard. The pride that comes from seeing a job completed. The sweat that comes from working on hot summer days. The feeling of accomplishment seeing something evolve from nothing. My children were able to experience this same reward over a weekend of adding onto our tiny lake house. We had outgrown our small lake house years ago. 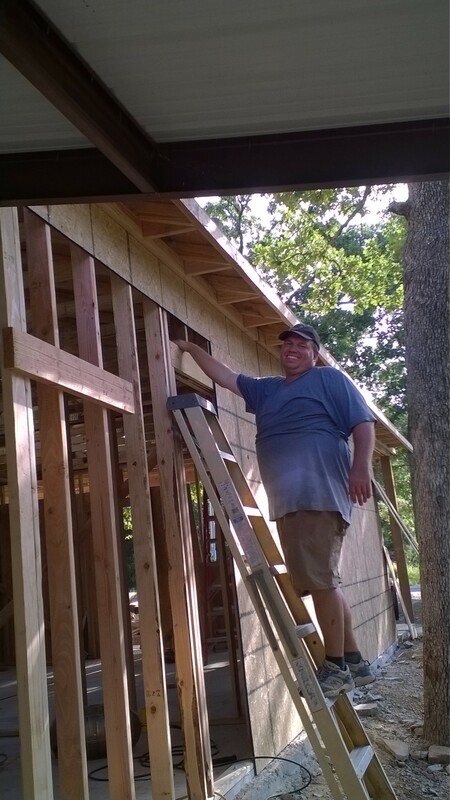 When we built the lake house over 10 years ago, our intention was to add on while the children were still small. That never happened. Life seemed to get in the way and finances didn’t seem to allow that luxury. So we continued to cram into the small 750 square foot house. It didn’t seem so hard when the children were small, but with preteen/teenage kids and 2 dogs, and often guests, it seemed more challenging over the years. Monkeying around after a hard days work. It was exciting to see the involvement of my children in the building phase. 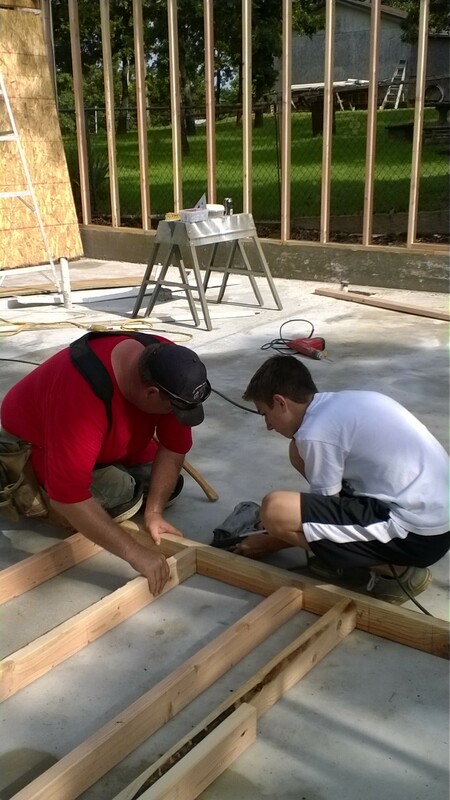 They were able to learn new skills, to use new tools, to work hard and sweat on a hot summer day. They were able to take instruction and help build things with their own hands. 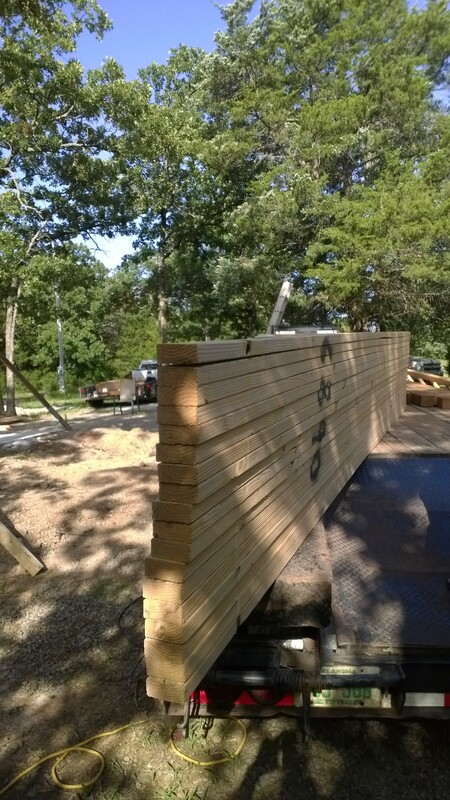 To take piles of lumber and watch it being transformed into a building. Watch out! He’s learning how to use the nail gun! 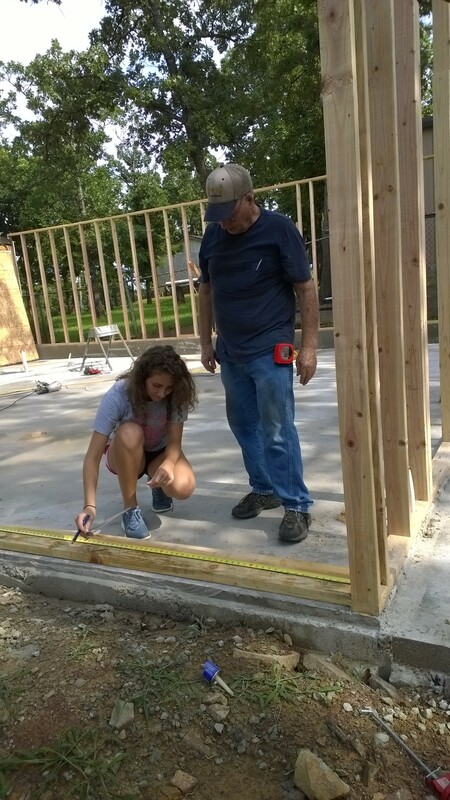 I loved watching my father-in-law teach my daughter how to measure the correct spacing for the studs to go into the walls. 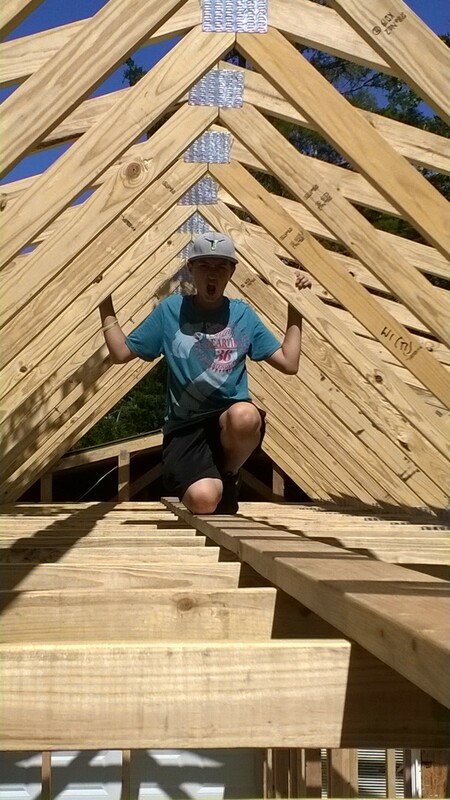 It was neat to see my sons use the nail gun and feel the power it brings. I enjoyed watching our family work together to accomplish our goal. And most importantly, I loved watching the ownership they have of the new space. They helped make it and it has become more important to them because they were a part of it. Getting closer to being finished for the day! They were able to experience the splinters, the sweat rolling down their faces and the sawdust sticking to their arms. The unity that they experienced working with grandparents, aunts, uncles and cousins on a shared project. They knew what it felt like at the end of the day to be tired and exhausted but also to look out and see the building take shape. To feel the pride that comes with working hard. The thing that most importantly stands out to me is that when you work together, you are building more than just the project that you are working on; You are building character, strength and integrity along with it. The building is just a representation of those character strengths that are being formed during the process. And that,my friend, is all in a days work. This little baby came in sooo handy! 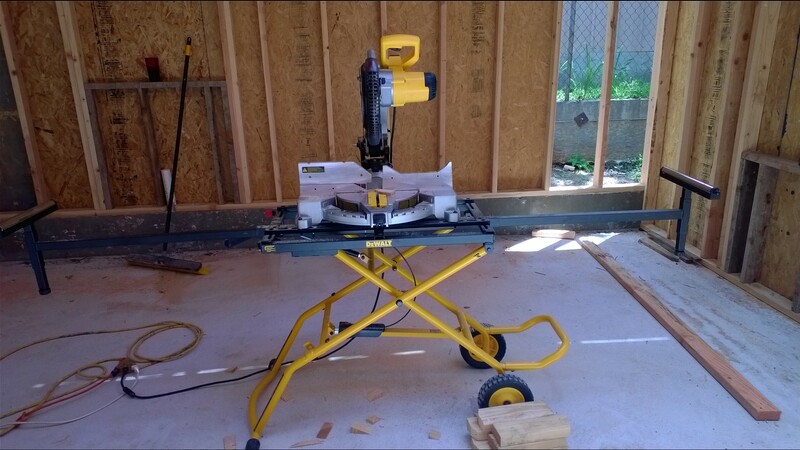 I could write an advertisement on how much I liked this saw & stand!